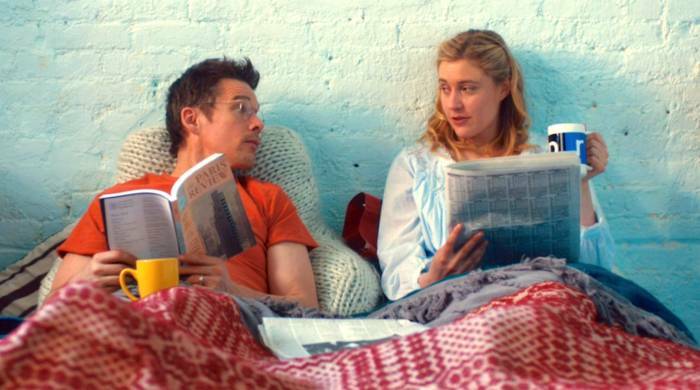 Sacramento’s Greta Gerwig looks nothing at all like Woody Allen. She’s a woman; plus she’s also good looking. But the movies Gerwig has appeared in are seriously influenced by what the Wood Man got himself into when he began writing, directing and acting in movies way back when. But then, credit must be given here when it’s so obviously due. That would be to the woman who wrote and directed the new movie in which Gerwig has taken the title role. Rebecca Miller is her name. She’s married to a man who knows a thing or two about acting. That would be Daniel Day-Lewis. Miller also was fathered by a man who knew a thing or two about writing plays. That would be Arthur Miller. The rest of the cast in Maggie’s Plan would fit well into a script Allen might write, too. Those actors would be Ethan Hawke, Julianne Moore, Bill Hader and Maya Rudolf. Hawke, as John, is wed to Moore as Georgette. Hader, as Tony, is married to Rudolf as Felicia. Tony and Felicia are best buds with Maggie. Hader is wickedly funny. Predictably, all of these characters are smart and totally at the mercy of their natural urges, but in deep denial of that fact. Maggie and John teach at Columbia University. At the start of the movie, the single Maggie decides she wants to have a baby … artificial insemination would be the procedure. She persuades a guy called Guy to provide the necessary natural ingredients to make the conception possible without so much as even being supine on a mattress. Travis Fimmel does Guy. Together, Maggie and Guy went to college … but that’s all. But Travis does try to make Maggie’s plan work in the more accustomed manner: no soap. Then as Rebecca Miller, Woody Allen and Fate would have it, Maggie falls for John. This emotional transformation occurs just as John and Georgette struggle with a marriage that’s nowhere … now … close to bliss. Woody’s written that “book” several times at his typewriter and living his life. 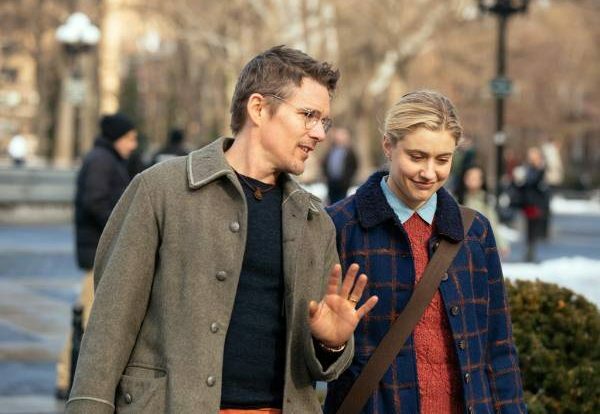 However, the story from which Maggie’s Plan comes is an original idea of Karen Rinaldi’s. Time can pass rapidly in a photo play; and so it does with Maggie and John. They get married and even have a darling little girl. (Guy had nothing to do with that, by the way.) Suddenly, and you’ll never guess what … Maggie realizes she’s falling out of love with John. Imagine! This is the real plan, not the artificial insemination project. Maggie conjures up a scenario to get John and Georgette back together. Now, imagine that. The characterizations in Plan are almost the stuff of grandeur. All hands are so, so themselves in their roles. Moore is especially gnarly and such the arrogant intellectual … speaking with an accent already. In her character’s state of mind, Moore kept making me think of the marvelous and sadly late Madeline Kahn in her classic role as Elizabeth in Mel Brooks’s Young Frankenstein … and as well, Kahn’s co-star, Cloris Leachman. Frau Blücher’s tightly wound coif is an earlier version of Moore’s hairstyle in Maggie’s Plan. I began to giggle almost constantly about 20 minutes in on this really funny movie. I urge you to take it in. It’s almost as riotous as hearing Kahn’s “Elizabeth” sing “Ah Sweet Mystery Of Life” after doing her roll-in-the-hay scene with the sadly late, great Peter Boyle. I’d lobby hard for Greta Gerwig to show up in a Woody Allen film. She’d fit in one his urbane yarns of infidelity like a glove. And, uh … forgive me … on the other hand, the Wood Man would simply just be himself in some kind of part in a Gerwig movie … say, as her Jewish agent or her old, sagacious and randy uncle or grandfather. I can see it now: an Allen movie for Millennials and geezers.